This week’s post is inspired by a friend who claims that she is a very bad cook and feels that she feeds her toddler the same things every day. I created this infographic in an attempt to make her (and my!) life easier. This is how it works: imagine that all three wheels spin. You can combine any section of each wheel with any section of the other wheels. You can also use more than one sections from each wheel and in fact, the more you use from the red wheel, the better. 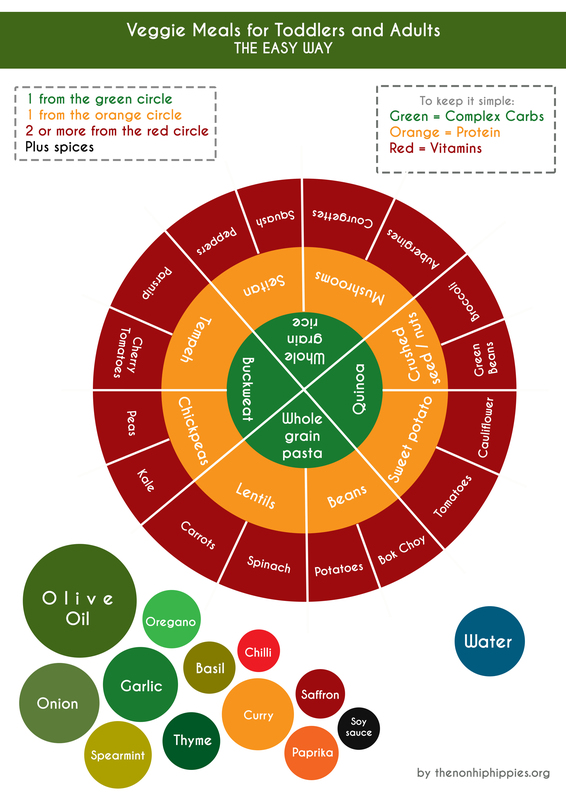 We are a veggie family, so this infographic is based on our own dietary choices and in fact it is ideal for vegans. Of course vegetarians and omnivores can use it with equally great results.